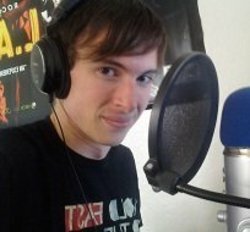 Sean Chiplock is a professional voiceover artist who has been quickly making his way into the industry scene, voicing for a number of popular characters in recent videogames and anime. Some of his recent roles include Cassim in "MAGI: Labyrinth of Magic", Ozma and Gruda in "Ys: Memories of Celceta", and Kiyotaka Ishimaru in the game "Dangan Ranpa: Trigger Happy Havoc" due out in February. He's just as much of a character in person, though, and enjoys talking to anyone about basically anything. A gamer at heart, he issues a calm but stern warning to any would-be Smash Brothers enthusiasts that he "packs a mean as hell Lucas". When not tackling his freelance work, he likes to mod and participate with the community chat on Saltybet.com, host radio podcasts and shows for Gensokyo Radio, and even prepare his next material for Anime Expo's Last Comic Standing competition, which he made the Finals for each year he's entered. He currently resides in sunny California, battling traffic almost as often as he battles his animated rivals.